Earth sits amid the magnetosphere, rendered in blue and surrounded by the solar wind. The white rectangle on the left identifies the area where ESA’s Cluster and China/ESA Double Star’s satellites discovered density holes. The brown dots represent the solar wind and ions back-streaming against the solar wind flow, along the interplanetary magnetic field lines (in black). The space above you is fizzing with activity as bubbles of superhot gas constantly grow and pop around Earth, scientists announced today. Astronomers found the activity up where Earth's magnetic field meets a constant stream of particles flowing out from the Sun. While space is commonly called a vacuum, in fact there is gas everywhere, albeit not as dense as the air you breathe. The newfound bubbles are technically called density holes. In them, gas density is 10 times lower. The gas in the bubbles is 18,000,000 Fahrenheit (10,000,000 Celsius) instead of the 180,000 degrees Fahrenheit of the surrounding hot gas, which is known as plasma [Graphic]. The bubbles were found in data collected by the European Space Agency's Cluster mission, a flotilla of four spacecraft. Researchers first thought they had an instrument glitch when the spacecrafts passed through bubbles. "Then I looked at the data from all four Cluster spacecraft. These anomalies were being observed simultaneously by all the spacecraft. That's when I believed that they were real," said George Parks, University of California, Berkeley. 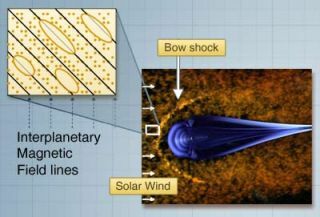 It is not known for sure how the bubbles are created, but the researchers suspect it involves the solar wind colliding with the magnetic field, which forms a boundary called the bow shock. The phenomenon is similar to the wake formed by the front of a boat. The discovery, detailed in the journal Physics of Plasmas, could help astronomers better understand how this solar wind interacts with the magnetic field.